"Is there any one in this world at present who is full of virtues and at the same time possessed of great prowess, who knows what is right, is well versed in Dharma (religion), who is conscious of service done (grateful), truthful, and of firm resolve? Who is possessed of right conduct and who is friendly to all living beings. Who is a man of knowledge, who is powerful and who has a singularly lovable appearance. Who has subdued his self, who has conquered anger, who is possessed of splendour and who is above faultfinding and whom the very gods dread when his wrath has been provoked in battle? I wish to hear this; for there is a great curiosity in my mind about it while you are capable of knowing such a man, O eminent Seer!" "Listen! I shall duly consider and tell you of such a hero. Be please to hear from me of the man endowed with the many and rare virtues and qualities mentioned by you. There is one born in the line of Ikshvaku and known by men by the name of Rama. He has fully controlled his mind, is very powerful, radiant and resolute and has brought his senses under control. He is intelligent, sagacious, eloquent, glorious and an exterminator of foes. He is distinguished with broad shoulders, powerful arms, a neck shaped as a conch and a stout chin. He is marked with a broad chest, a mighty bow and a collar bone covered with flesh, Ram is capable of subduing his foes. His (unusually long) arms extend right up to his knees. He has a well formed head, a shapely forehead and a charming gait. He is of medium stature, has well proportioned limbs and of charming complexion. He is mighty. He has a well shaped chest, large eyes, is full of splendour and has auspicious marks on his body. He knows the secret of virtues and is true to his promise. He is intent on the good of the people. He is illustrious, full of wisdom, pure in his dealings, a man of self-control and a sharp (concentrated) mind. He is like the Creator Brahma in supporting all, affluent, the slayer of his enemies, protector of all living beings and a staunch defender of faith (Dharma). He is well principled and protects his people. 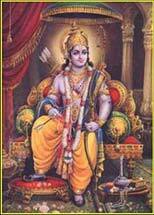 He knows the truth expounded in the Vedas and Vedangas (six sciences) auxiliary to them and is a master in archery. He knows the real meaning of all the scriptures , possessed of a bright intellect and good memory. He is gentle, noble, shrewd and is loved by all. He is always sought by the righteous (even) as the rivers seek the ocean. He is courteous to one and all and always well composed, noble and always wears a pleasing countenance. He is endowed with excellence and gladdens the heart of his mother Kausalya. He is dignified and profound like the ocean and firm (steadfast) like the Himalayas. He is a replica of Lord Vishnu in prowess and soothing like the moon. In (show of) anger he resembles the conflagration (destructive fire) at dissolution (end of creation). He is a counterpart of Mother Earth in forbearance. He equals Kubera (the god of riches, the bestower of wealth) in liberality and steadfast in truth like Lord Dharma." Sri Rama was the Parmatman (Supreme Reality) and that Sita was the Jivatman (embodied individual soul). Each man’s or woman’s body was the Lanka. The Jivatman which was enclosed in the body, or captured in the island of Lanka, always desired to be in affinity with the Parmatman, or Sri Rama. But the Rakshasas would not allow it, and the Rakshasas represented certain traits of character. For instance, Vibhishana represented Sattwa Guna, Ravana represented Rajas Guna and Kumbhakarana represented Tamas Guna. Sattwa Guna means goodness, Rajas means lust and passion and Tamas means darkness, stupor, avarice, malice, and its concomitants. These Gunas keep back Sita, or Jivatman, which is in the body (Lanka) from joining Paramatman (Rama). Sita, thus imprisoned and trying to unite with her Lord, receives a visit from Hanuman, the Guru or divine teacher, who shows her the Lord’s ring, which is Brahma-Jnana, the supreme wisdom that destroys all illusions. Thus Sita finds the way to be at one with Sri Rama or in other words, the Jivatman finds itself one with the Paramatman. Dasaratha symbolises the intellect that controls the senses. The three queens of Dasaratha are the three Gunas known as Sattwa (tranquillity), Rajas (activity), and Tamas (malice, ignorance, darkness). Vasishtha and Viswamitra are the gurus who guide the intellect. Rama is the transcendental Self and Lakshmana, Bharata and Satrughna (Rama’s three brothers) are the triple manifestations of God as immanent, God as in-dwelling spirit, and God as soul, respectively. Manthara (the maid servant) symbolises the negative qualities that poisons Kaikeyi (the Rajasic-Tamasic mind). Demons and demonesses in Ramayana are the evil propensities in us. Ravana is the Rajasic ego. Kumbhakarana is the Tamasic ego. Vibhishana represents the Sattwic ego. Rama’s wife Sita is the Cosmic Energy (Kundalini) abducted by Ravana, the ego, for wrong use. So, through (with the help of) Hanuman, symbolising Pranayama, or rhythmic breathing, you will find the location of Sita, the energy and convey the news of Rama, the Self. Rama’s destruction of Ravana and Kumbhkarana symbolises the destruction of Rajasic and Tamasic egos. The installation of Vibhishana symbolises the establishment of Sattwa Guna and equanimity through Self-realisation. Union of Rama and Sita is the union of Shakti with the eternal consciousness of the true self. Rama’s coronation symbolises the Kingdom of Heaven on earth. This, in short, is the esoteric meaning of Ramayana. Dasharatha, King of Aydohya, has three wives and four sons. Rama is the eldest. His mother is Kaushalya. Bharata is the son of his second and favorite wife, Queen Kaikeyi. The other two are twins, Lakshman and Shatrughna. Rama and Bharata are blue, perhaps indicating they were dark skinned or originally south Indian deities. A sage takes the boys out to train them in archery. Rama has hit an apple hanging from a string. In a neighboring city the ruler's daughter is named Sita. When it was time for Sita to choose her bridegroom, at a ceremony called a swayamvara, the princes were asked to string a giant bow. No one else can even lift the bow, but as Rama bends it, he not only strings it but breaks it in two. Sita indicates she has chosen Rama as her husband by putting a garland around his neck. The disappointed suitors watch. King Dasharatha, Rama's father, decides it is time to give his throne to his eldest son Rama and retire to the forest to seek moksha. Everyone seems pleased. This plan fulfills the rules of dharma because an eldest son should rule and, if a son can take over one's responsibilities, one's last years may be spent in a search for moksha. In addition, everyone loves Rama. However Rama's step-mother, the king's second wife, is not pleased. She wants her son, Bharata, to rule. Because of an oath Dasharatha had made to her years before, she gets the king to agree to banish Rama for fourteen years and to crown Bharata, even though the king, on bended knee, begs her not to demand such things. Broken-hearted, the devastated king cannot face Rama with the news and Kaikeyi must tell him. Rama, always obedient, is as content to go into banishment in the forest as to be crowned king. Sita convinces Rama that she belongs at his side and his brother Lakshman also begs to accompany them. Rama, Sita and Lakshman set out for the forest. Bharata, whose mother's evil plot has won him the throne, is very upset when he finds out what has happened. Not for a moment does he consider breaking the rules of dharma and becoming king in Rama's place. He goes to Rama's forest retreat and begs Rama to return and rule, but Rama refuses. "We must obey father," Rama says. Bharata then takes Rama's sandals saying, "I will put these on the throne, and every day I shall place the fruits of my work at the feet on my Lord." Embracing Rama, he takes the sandals and returns to Aydohya. Years pass and Rama, Sita and Lakshman are very happy in the forest. Rama and Lakshman destroy the rakshasas (evil creatures) who disturb the sages in their meditations. One day a rakshasa princess tries to seduce Rama, and Lakshmana wounds her and drives her away. She returns to her brother Ravana, the ten-headed ruler of Lanka (Sri Lanka, formerly Ceylon), and tells her brother (who has a weakness for beautiful women) about lovely Sita. Ravana devises a plan to abduct Sita. He sends a magical golden deer which Sita desires. Rama and Lakshman go off to hunt the deer, first drawing a protective circle around Sita and warning her she will be safe as long as she does not step outside the circle. As they go off, Ravana (who can change his shape) appears as a holy man begging alms. The moment Sita steps outside the circle to give him food, Ravana grabs her and carries her off the his kingdom in Lanka. Rama is broken-hearted when he returns to the empty hut and cannot find Sita. A band of monkeys offer to help him find Sita. Ravana has carried Sita to his palace in Lanka, but he cannot force her to be his wife so he puts her in a grove and alternately sweet-talks her and threatens her in an attempt to get her to agree to marry him. Sita will not even look at him but thinks only of her beloved Rama. Hanuman, the general of the monkey band can fly since his father is the wind, and Hanuman flies to Lanka and, finding Sita in the grove, comforts her and tells her Rama will soon come and save her. Ravana's men capture Hanuman, and Ravana orders them to wrap Hanuman's tail in cloth and to set it on fire. 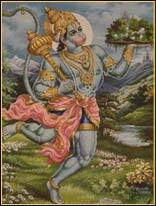 With his tail burning, Hanuman hops from house-top to house-top, setting Lanka afire. He then flies back to Rama to tell him where Sita is. Rama confronts ten-headed Ravana. (Ravana is known for his wisdom as well as for his weakness for women which may explain why he is pictured as very brainy.) Rama finally kills Ravana. Rama frees Sita. After Sita proves here purity, they return to Ayodhya and Rama becomes king. His rule, Ram-rajya, is an ideal time when everyone does his or her dharma and "fathers never have to light the funeral pyres for their sons." Mahatma Gandhi dreamed that one day modern India would become a Ram-rajya.